I’ve been amassing shopping tales for a while now and have been trying to figure out how best to present them. Shopping here seems to fall into two main categories: necessity shopping, which includes commissary (food) shopping, clothing and household item shopping; and non-necessity-but-really-pretty/fun/unusual shopping, which basically includes chach-ka and local artistry (tapestries, woodwork, alabaster, silver, gold, etc.). Could one argue that the latter shopping category is never needed? I guess so, but then what fun would it be 50 years from now to tell people, “I could have bought a hand-made _____ (fill in with desired item) when we lived in Cairo, but I knew it wasn’t really necessary.” I mean, how silly. And some items, such as a unique metal desk lamp, can happily reside in both shopping categories, as can alabaster candle holders, though I would assume when you reach a certain quantity of said alabaster candle holders, they may tip into the non-necessity category. The bottom line is, there are thousands of shops, the prices are usually very very good, and it can be a lot of fun. I will admit that Ron and I have also made great use of the online shopping options as well, in huge thanks to having the use of an APO, but that has been primarily for electronics (I swear we already had one of everything, but I have been told I’m wrong, very very wrong), some books, clothing, shoes (I found my need for varied mock-crocs was increasing), and initially some vegan food goods before I found that our commissary stocks, among other things, tofu pups (I can probably assume that I am the only one who did a little happy-dance when I saw them there the first time). While we do have some Target-like shopping options here, in Alfa Market and CarreFour, they are limited and I find that by embarking on an expedition to find a cutlery tray, compost bin, or red pen, my explorations of Maadi have gone much farther than they would have had I relied on the limited selections at Alfa Market and CarreFour. So I opt for the hunt and discover method often. There are a few commonalities that have arisen during my shopping trips. Shopkeepers are typically very nice and friendly, sometimes bordering on clingy or overly-eager – unlike in the states where you’re followed around a store because they fear you’re going to pinch something, here they want to be nearby in case you need absolutely anything. Prices are rarely listed, and it seems that upon inquiring a price is randomly selected from the air (this is even true in non-chach-ka stores). Bargaining can be attempted, but may or may not be successful, so depending on how much you want the compost bin, red pen or alabaster piece, you may just have to pay the air-picked price. Other than larger grocery stores, no one has much change – sometimes just getting five pounds back involves sending a runner to another store. Stores often appear closed but I’ve found it’s beneficial to actually attempt entry as many of them just don’t turn on lights until there’s a customer. Upon customer’s entry they happily turn on all the lights and start the A/C or fans running (I often feel guilty when I’m just window shopping and want to tell them they don’t have to bother, I’ll just poke around in the dark). And practically without exception, everything you buy needs to be thoroughly washed off when you get home. 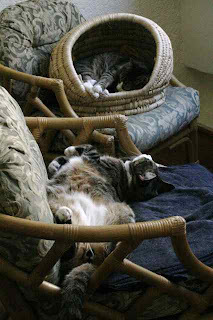 We recently decided to purchase a wicker-like-straw-woven cat basket from the Road 9 basket seller (we had hopes that Chuckles would find it an adequate scratching-post, as opposed to the government furniture which we discourage with great hoots and hollers and arm waving). This man displays his baskets on the street corner every day. I’ve also seen the same baskets hung from carts elsewhere in Maadi, but due to our proximity we see this basket-seller more often. We stood there asking the prices of this basket and that basket, while he pulled them from the piles and tried to lure us into buying larger ones. 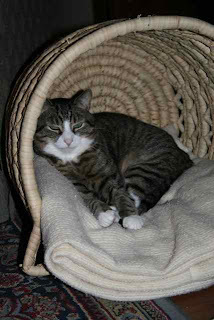 He feigned misunderstanding when he was piling up a cat-basket and a laundry-type one, thinking we wanted both. He suddenly grabbed a third basket, threw it in the bottom and announced it was a free one. He kept dropping the price and we finally gave in and bought all three. Ron attempted to carry the towering stack of baskets (which are surprisingly heavy), only to have the cat-basket topple off and knock over a bicycle leaning against a tree. I jumped over, handed the cat-basket to Ron and attempted to right the bicycle. Having received a beautiful Cannondale road bike a few years ago, which I can carry with one hand due to its titanium frame, I found this ancient relic of a bike outlandishly heavy. You’d have thought it was a baby Harley. I actually could barely stand it up, let alone get it to lean against the tree. During this struggle, I refused to look around to see how many of the reams of men who are always sitting or wandering around, were watching the crazy blond expat wrestle with a bike (I’ve recently embraced my differences and have started wearing a safari-like hat outside as well, merely furthering the entertainment factor, I’m sure). Ron came and helped me and we managed to get the bike stable and upright, then gathered up our purchases and huffed it home. Once home, I took all three baskets straight to the bathtub and proceeded to wash them all off. The dark brown water that drained out was actually a bit startling. Since then, I have taken to washing everything, including the plastic compost bin which I thought was a light gray and sage, but after cleaning found it was actually white and green. This is no comment on the cleanliness of shops or shopkeepers. This is life in Cairo – where the dusty dirt filters through every crack and settles regardless of how much you try to fight it. And often the way shopkeepers fight it is by attempting to wipe the dust off with a rag only upon purchase. Why bother otherwise? So I’ve just begun the practice of washing/wiping everything purchased once we get home, as well as carrying travel wet-wipes with me always. I guess it’s either this or adopt the overly-packaged, excessively-wrapped methods back home, and considering that this country does not need any more excess garbage (not to mention the planet as a whole), I’ll gladly rinse off everything after purchase.